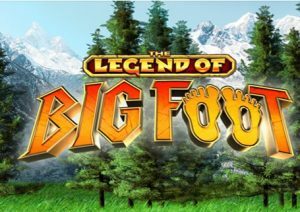 America’s answer to the Loch Ness Monster takes centre stage in The Legend of Big Foot, a 5 reel, 10 to 20 payline video slot from Barcrest. This trip to the wilderness comes with base game modifiers that deliver symbol changes, respins, extra wilds and wild reels as well as a free spins round with even more added wilds. Play on your desktop, tablet or mobile from 10p to £300 per spin. Symbol Swap feature – Big Foot swaps a symbol from a losing spin which creates a new winning combination. Random Wilds feature – the reels are given a shake and a random selection of wilds drop down onto the reels. Wild Reels feature – Big Foot turns reels 2 or 4 or better still both totally wild. Respin Reels feature – any scatters are held and all 5 reels spin again. Respin Last Reel feature – if you land 2 scatters, you get another shot at landing the 3rd scatter for the feature. That feature is the Free Spins feature and is triggered by landing the scatter on reels 1, 3 and 5 on the same spin – you’ll then be awarded 8 free spins. Whenever a Big Foot symbol hits during the feature, it adds to the free spins trail. There are a number of levels to work through which offer more free spins and plenty of added wilds. Collect enough for the top level and you’ll get 7 added wilds on each of those free spins. In total, you can get 34 free spins with plenty of wilds on each free spin. As is the norm for a Barcrest video slot, you can pay extra and play in Big Bet Mode – this set of 5 linked spins comes with extra Big Foot modifiers and double height scatters in the base game and/or Free Spins feature. We’ve not always been impressed with the design of Barcrest video slots but the sound and imagery here are pretty good if not quite top class. The setting is a dense American woodland. On the reels you’ll see raccoons, beavers, eagles, moose and wolves as well as the usual lower value playing cards. The best paying symbol is the big cat which awards up to 25 times your total bet per payline. Big Foot himself is the game’s wild. There’s plenty of variety on offer in this trip to the forest. We found the really big action as elusive as Big Foot himself. The base game modifiers come along regularly though to keep things interesting and the added wilds in the Free Spins feature offer some very decent potential. The big beast on which it’s based may be mythical but with its solid design with impressive range of extras The Legend of Big Foot offers some very real entertainment. If you like games based on beasts, Jungle Giants by Playtech is recommended.